All transactions are safe and secure with a reliable history in online purchasing behind each of our associates. 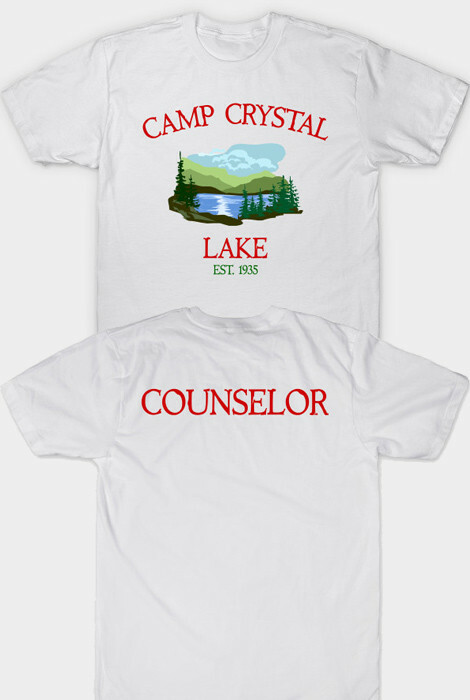 Buy the Camp Crystal Lake Counselor t-shirt to own Friday the 13th clothing and merchandise. Join fellow Camp Crystal Lake counselors Ned (Mark Nelson), Jack (Kevin Bacon), Bill (Harry Crosby), Marcie (Jeannine Taylor), Alice (Adrienne King), and Brenda (Laurie Bartram) as they work to refurbish the cabins and facilities under the supervision of the camp's owner, Steve Christy (Peter Brouwer). This Camp Crystal Lake t-shirt gives you the chance to represent the most exciting summer camp around. As a counselor, you're also in charge of supervising the kids during swim time. In addition to the Camp Crystal Lake Counselor tee above, browse the Friday the 13th Clothing Gallery for more apparel like men's and women's clothes, kids shirts or hoodies.